This idea has been somewhere in the back of my mind for a while, but it came together last week when Marvel Comics announced that they are launching a series of YA novels, based on their superhero characters. 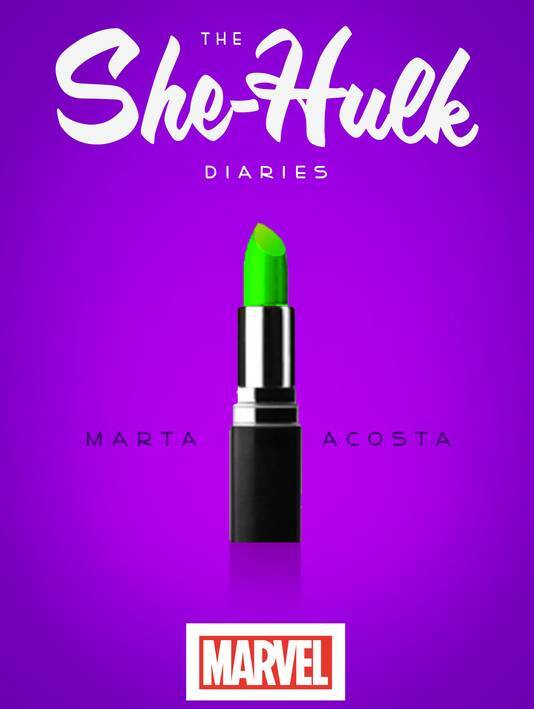 The first two announced are She-Hulk and Rogue, written by Marta Acosta and Christine Woodward and they will be published by Hyperion. I’m going to be stay optimistic. I’m going to say I’m excited by these and I hope they do very well. And I’m not being disingenuous. I want young people, those under 25, especially those under 20, to be interested in comic book characters, whether that’s from Marvel, DC or other publishers. Superhero comics dominate the US comic book market, but in other countries superheroes are not the main focus. Despite the diversity that now exists in the US market, the majority of the top 100 comics every month are superhero titles. There are exceptions (Walking Dead, Saga etc) but mostly it’s superheroes. In the last 2 years both Marvel and DC have had one of their biggest reboots and relaunches in a long time. Not just a bit of a tweak, but an almost (almost!) wipe the slate clean and start from issue 1 across the board at DC. Marvel took a right turn and all titles are gradually relaunching with new creators and very new directions. All of which has been great for me, as a lifelong comic book fan. Sales are good in general, but my gut tells me that the percentage of brand new comic book fans, coming into Marvel or DC for the first time because of these initiatives, is very small. My gut also tells me that not many of those were women. DC and Marvel are always actively seeking new writers and they do mentor new writers. They pair them up with an established creator who helps them learn the ropes. We’ve seen this time and again at Marvel and now some of their most interesting and unique writers were once being mentored. Jonathan Hickman and Matt Fraction are two names that immediately spring to mind. DC are also doing it as well, and people like James Tynon IV first partnered with Scott Synder before writing solo books. It’s a tried and tested method. Both companies also bring in writers from other mediums, TV, film and novelists. Sometimes it works out very well and we get writers like Duane Swierczynski and Allan Heinberg, both of who have done some very memorable work for Marvel and DC. Sometimes it doesn’t work and we get Jodi Piucoult. I am sure she is a lovely person and I know her novels sell very well, but her run on Wonder Woman was very short and she’s not been invited back. Her view of the character did not gel with the audience, sales were poor, and they tried a different approach with a new creative team. I’m very aware that women read comics and superhero comics, but I think there are more men reading them than women. I also think it’s fairly safe to say that the percentage of new and young readers coming into the books is fairly small. I’m also pretty sure that if you took the average age of a mainstream comic book fan, it would be twenty or thirty something, if not older. Here’s a wacky idea to get more new readers and more women reading comics. Perhaps, in addition to the YA books, Marvel and DC should hire some YA authors to write their teen comic books. As I mentioned above, it doesn’t always work out and if the person is not a fan of comics to begin with, or is not at least familiar with the medium, then the chances of success are fairly small. But I know of several YA authors, most of them women, who are massive comic book fans and I know they would love to write comics. Can and do some of them write their own independent comics? Yes. But getting noticed and getting the word out about one of those comics is a lot more difficult. Also, both of the big companies have some very well known brands and icons that are immediately recogniseable. It’s a lot easier to convince someone to take a chance and spend their money on a new Supergirl comic than something they’ve never heard of before. I’m sure most, if not all of the YA writers, would need to be mentored first, and during that co-writing phase both the lead writer and the company would find out if it was working or not. But imagine if it worked. A Teen Titans book, written for a YA audience. Now this isn’t me dumping on any of the teen focused books that have gone before, because I have read and enjoyed some of them. But DC in particular made an effort to put some of their comics into sections. Here are the Dark books (Vertigo-esque) grouped into The Edge, here are the Teen books, here are the Batman books etc. So with the relaunch I’m not the target audience for Teen Titans. In theory, it would also mean that if more younger readers jumped on board with the teen books and assuming they keep reading for several years, they would eventually progress to the mainstream titles. It would also mean more women reading comics, more female role models working in the industry, and hopefully more women who become mainstream comic book writers. The number of women writing at both companies, who are working on major icons, is tiny. I’m not privy to what is going on behind closed doors at the Big 2, and I’m sure those who are may instantly reject my idea for a number of reasons, or perhaps if I am being optimistic, these sort of talks are already taking place. From an outsiders viewpoint, it seems like a sensible and logical idea to me. It ties together some of what they are already doing and it would tackle one of the biggest problems in mainstream comics. It wouldn’t solve everything but it would be a step in the right direction.